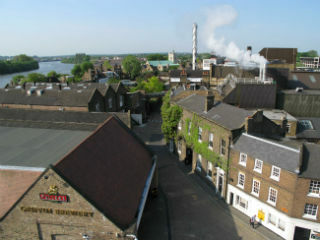 Combine a brewery visit and beer tasting at one of Britain’s most celebrated breweries, a picturesque short walk along the River Thames, and an exploration of local brewing and distilling heritage on this unique walking tour. Your host for the tour is renowned London beer expert and Accredited Beer Sommelier Des de Moor, author of The CAMRA Guide to London’s Best Beer, Pubs and Bars, tutored tasting host and experienced walk and tour leader. The tour's total walking distance is 2¼ miles (3.5 km) on mainly flat ground with plenty of stops along the way. There are some steps, though, and several flights of stairs in the brewery with few places to sit down, so those with mobility issues may find the tour challenging. Tours operate rain or shine and comfortable shoes and outdoor clothing essential. Maximum group size is 15. We can also provide this tour as a private booking, so please contact us for details. Enjoy Fuller's new and refurbished brewery shop, complete with pilot brewery!